AVWW Beta 0.543, "The Black Wind Blows," Released! This one is our first one since coming back from the Thanksgiving holiday -- hope everyone else who celebrates it had a great holiday also. There are a number of important bugfixes to this one, including the "leveling up takes off my suit" bug that was causing a number of people to die a fiery (or frigid) death. Windstorms have also seen a major expansion of their power, such that the wind is actually a force that you (and your projectile spells) can feel in a tangible way. Thanks in particular to Armanant for his suggestions there! On the forums, if you've missed it, there have lately been a number of threads where we're asking feedback on various things we're brainstorming about. The first one was redesigning health and mana, followed by one on inventory, another on possible food systems, another one on allowing players opportunities for cleverness, another based around expanding the concept of permadeath in the game, and lastly a fun one where you can submit epitaphs to be shown on in-game graves! There's also been a lot of progress on multiplayer, which seems like a really repetitive and generic thing to be saying at this point. But lots more bugs were found and squashed, and Keith and Josh have been having increasingly successful tests. I think Keith's list of must-do-before-first-public-alpha-of-multiplayer items is currently about 9 items long, but it goes up and down pretty rapidly. Some of the recent bugs and regressions in single player have been results of the multiplayer heavy revamps, but that's settling down and really I think there's been remarkably little collateral damage there. My hope is still to see a first public alpha of multiplayer sometime this week, or next at the latest, but that really depends on what further bugs are found as the testing cycle continues. Trust me, no one is more tired of that cycle than Keith, so we're really hoping that winds down shortly and he gets to do "something, anything else." But it's exciting to see multiplayer coming together, and we're both really looking forward to being able to play with our wives, speaking for ourselves. Looking to pick up some great gifts for yourself or loved ones on Black Friday, but boarded up in your home as you rightfully should be? Great news! Online digital distribution king Steam is having an Autumn Sale, and we're participating big time. Right now you can get AI War and all of its expansions for 75% off. That means you can get the base game for $5, small DLC for $1, full expansions for $2.50, and the whole AI War kitten caboodle together with some extra savings in the Alien Bundle for just $7.50. If that wasn't enough, Tidalis is 80% off, and goes for just $2 instead of the standard $10 tag. The sale only goes through this Sunday, November 27th. So be sure to take advantage of these huge discounts now! AVWW Beta 0.542, "Centurion AI," Released! This one has been really quite a long time coming, hasn't it? Unusually so, for us. Well, it's packed to the gills with internal enhancements to both the enemy AI and multiplayer. We're really getting close to being able to start our first opt-in multiplayer public alpha testing, which is very exciting for us. That's a major milestone for the game in general, and also it means that Keith will be able to do something else with his time other than toiling silently behind the scenes on the multiplayer code! Not that it hasn't been fun... but, no, actually I think Keith is too polite to say it but it hasn't been any fun. Fortunately, for players it should be quite a bit of fun! The other big thing in this new version is a huge new AI behavior system, which is way more flexible and allows us to make enemies behave in much more interesting and complex ways. A number of enemies take advantage of this at higher levels, and there are two new enemies which make particular use of the new features. Many of the existing enemies are intentionally simplistic in their AI, since they are for the earlier parts of the game, but most new enemies will be using the more advanced AI options. There's also new music in this release, a goodly number of new room map templates, some minor bugfixes, and a couple of minor balance tweaks. Enjoy! 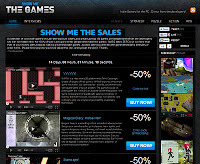 Our friend Cliff Harris has launched an awesome sale over on Show Me The Games. Aptly titled Show Me The Sales, you'll find Tidalis, AI War, and over a dozen other excellent indie games for a fraction of their standard price tag. The cool thing about the sale, other than the nice discounts, is that 100% of all sales go directly to the developers. SMTG doesn't take a dime. The sale only last 14 days, so if you're interested in supporting indie developers to the fullest and picking up some awesome titles (Frozen Synapse, Gratuitous Space Battles, VVVVVV, and many more), best take advantage of the offers soon. AVWW Beta 0.541, "Plasma Bolt," Released! This one has some pretty major internal changes in terms of how the AI functions for the monsters in the game. I'm not completely done with those upgrades yet, but already the AI has some cool new capabilities. For one thing, enemies can now change behaviors as their level gets higher. So, for instance, now icicle leapers start actually chasing you once they hit level 5, but not before. The insect orb scroll was also ridiculously overpowered in the prior versions, and has been scaled back quite substantially. It's still a really solid spell, especially against masses of enemies or really large enemies (more of the bugs hit larger enemies, doing more damage than they would to a smaller enemy -- also true of circle of fire and ice cross, by the way). There's also a cool new plasma bolt spell suggested by KDR_11k. Finally there's a cheaper light-element offensive spell, like fireball or forest rage or similar in some of the other elements. This one has its own slightly different flavor as well, but most importantly it gives you more options when you run into a boss that is weak against light but not much else. There's some other bugfixes in here as well, yet more multiplayer internal progress, and... a new enemy in the lava flats. I won't say what it is, but I think it has to be my favorite enemy so far. I intend to do more enemies with... the general theme of this enemy. It also has some of the more interesting AI behaviors, at least to me; it took a while to get that tuned right, but now I can reuse that general code in other enemies to make even more complex behaviors. The next release is likely going to be an unusual stretch from now -- probably we're looking at Monday the 14th, so half a week from now. I'm going to be out of the office until then with some personal stuff, but I'll be back and raring to go on Monday. When I get back, one of the things I really want to work on, aside from yet more spells and scrolls, is increasingly complex and interesting enemies. But for now I think there's a great amount of recent new stuff to experiment with, anyhow. Enjoy! A quick note that our massive co-op space strategy title AI War is 75% off as Steam's Daily Deal. That means today only the base game runs just $5 instead of $20, expansions run just $2.50/$1.00 instead of $10/$4 each, and the Alien Bundle (which contains all of the aforementioned) goes for a paltry $7.50 instead of the standard $30 tag. A great deal, and as good a time as any to jump into the fight. Offer ends tomorrow, November 9 at 10 AM PT. AVWW Beta 0.540, "Whips, Bursts, And Insects," Released! This one has two new spell scrolls and one new spellgem. It also has a couple of tweaks and bugfixes. The most interesting thing about these new spell scrolls is that these are the first two that are offensively-oriented in a direct fashion. Previously scrolls were all logistical, healing, or movement type effects, except for the summon rhino -- which, while offensive, is fairly indirect. Insect Orb and Ice Burst are both as directly offensive as they come, but they are unique from any of the spellgems. That's something that we plan to do more of, as it's interesting to me to have limited-use offensive spell scrolls that are nonetheless having the advantage of costing no mana. Right now there's still only about 9 spell scrolls in general in the game (compared to 34 spellgems at the moment), so there's really a lot more to do on scrolls to even get them caught up to the spellgems. I'm still expecting to have 100+ of each spell scrolls and spellgems by the time we hit 1.0. The new Miasma Whip is a particularly fun one for me, as it's a refreshingly fast entropy-based attack that isn't quite so short-range as Death Touch. Given the elemental strengths and weaknesses that bosses now randomly have, it's kind of important to have a lot of offensive options in every element. We're still not quite there yet, but there's lots more to come soon! More to come tomorrow! The rest of today is going to be spent on updated installers, some new distributor setups, and so on. Enjoy! AVWW Beta 0.539, "In-Game Reference Window," Released! This one isn't what I'd planned on doing today, but I'm really glad that I took this detour -- and I think that even experienced AVWW players will be, too. The big new feature in this version is the "reference window," which lets you get at full stats for crafting, civ-level unlocks, and materials. No enemies yet, but that will be coming sometime down the road along with a related "scan" spell. Also included in the reference window is an advice and tips section, which basically replaces the adviser guardian functionality with an available-anytime tips section broken out by category and subject line. That's SO much better than a bunch of paragraphs that were sequential and semi-ordered (since only so much ordering could be done). The reference window, on the one hand, might be seen as being geared toward new players. And I certainly hope it will help new players quite a bit. But actually, I think that this will become something that even experienced players use on an ongoing basis as more spells and recipes and so on are added. The reference window essentially saves you from having to run back to town every time you want to look something up -- and it saves you from having to find some external wiki about the game, too, which was another goal of mine. I had planned to spend today adding a bunch of new spells and enemies, but I really felt like the reference was something that was needed first. It's something that a lot of different players have asked for the various component parts of, and it's something that can be extended over time in terms of the tips it offers, and adding in things like icons and whatnot later rather than having it just be textual like it currently is. There's also a couple of bugfixes in this one. The GC exception one should be particularly welcome. More to come tomorrow, although some of my day is going to be spent putting together a new installer build since it's been a while and since we're going to be having the game come to some new distributors. But my goal is to also get some new spells in there tomorrow, too. Enjoy! AVWW Beta 0.538, "Intro Mission At Last," Released! This one is one that I've really been looking forward to ever since beta began: the intro mission for the game is now complete! Pending feedback and further testing, of course, but so far it seems pretty good to me. The goal for the intro mission is to give new players a linear way to get acclimated with the game before they ever encounter the world map or have to make broader decisions, etc. This is a more traditional intro for any sort of platformer, really: you start out with no ability to do anything except run and jump, and rapidly gain new abilities that have to be used immediately. My inspirations for this ranged from the original Metroid, to Braid, to Limbo. Other goals for the intro mission included to make it so that it has some goodies that you want, some side (fairly mild) secrets to find, and some optional challenges to face to get ahead in the game if you want to tackle them. Oh, and another goal was to make it so that if you want to speedrun the intro mission, you can do so pretty quickly. I just clocked myself at three minutes and three seconds on a speedrun, and I: 1) detoured to get storm dash; 2) took two very minor wrong turns; 3) took the time to stop and kill the optional miniboss in the last surface chunk just to get the EXP. I imagine that if someone were so inclined, they could shave as much as 30 seconds off my time, if not more. For an actual new player who is playing through the intro mission for the first time and who is stopping to read the tombstones, explore all the little caverns, and so forth... I'm not sure what the completion time would be. I imagine it would vary; anywhere from 10 to 30 minutes seems likely to me, but that's just speculation. There are 24 hand-crafted chunks to explore, but about half of them are completely optional. But the important thing is that a new player isn't just sitting there reading a boring tutorial, or doing boring tutorial-style things. This is why I'm not labeling it a "tutorial," although it does serve that purpose. It's more like the first 10-30 minutes of Metroid, where your character has fewer powers and fewer options on where to go, but still full autonomy within those constraints. This is also where the inspirations from Braid and Limbo come in, is that they weave their tutorial into the main gameplay in this way, too. Once you complete the intro mission, will you be an expert at AVWW? Of course not. But you should be comfortable navigating around the world in the side view, and familiar with how buildings, surface areas, and undergrounds all work. You should be able to feel comfortable striking out on your own to explore the world map -- which is kind of the point. People were getting to the world map too fast before, and feeling intimidated by it rather than excited. Hopefully this changes that first encounter with the world map in a fundamental way, but I guess we'll see. Whatever the case, the new player experience is vastly better now than it ever was before, anyhow. Well, there's a laundry list of bugfixes and tweaks that I won't just repeat verbatim here -- check out the full release notes for those. One big change is that enemies no longer die from environmental factors like walking off the side of the chunk or falling into water/lava, though. Instead, at the side of chunks they just turn around, and with the water/lava they now have a little meter that quickly fills up before they shrink away to nothing and respawn at some random monster spawner. This style of respawn, in practice, isn't much different from what the game was doing before, but it will have some major positive ramifications for multiplayer (and several smaller positives for solo). See the release notes for some details. The next really big change is to how damage gets calculated for your equipment. The details are once again in the release notes, but the general message is that way-outdated stuff is now worse than it was before, while better-than-your-current-tier stuff is now more useful than it was before. More to come tomorrow: I'm excited to finally be able to get back to some content development, so expect some new spells and possibly some new enemies. This week is going to be a quite odd schedule for me, as I have some personal stuff going on and I'll be out of the office from this coming Thursday through Sunday; so this weekend I'm getting in some extra time to get ahead of things. Anyway, I know folks will be pleased to see me working on stuff for existing players rather than new players again. Enjoy! AI War Beta 5.020, "Nanoswarm Fortress," Released! This one has a couple of pretty significant balance tweaks that folks should really appreciate. Firstly, the Fallen Spire exogalactic strike forces are a bit better tuned. Secondly, the youngling nanoswarms now really are better at their job of hitting a lot of targets. And thirdly, the AI fortress health has been halved, making them not remotely such a grind as they were. AVWW Beta 0.537, "Elemental Resistance," Released! This one is a pretty sizable one in terms of what it changes about the "feel" of the game. The big new thing for existing players is the elemental damage system: spells each belong to one of six elements (fire, water, earth, air, light, and entropy), matching the colors of the gems used to create them. Enemies then have weaknesses or resistances to specific elements, meaning that (as in many games) lightning attacks are more effective against robots, and you can't hurt a being made out of fire by attacking it with fire. Beyond that, bosses also now get randomized elemental resistances mixed in with their other unique-to-the-individual health/attack/casting-speed bonuses. And lastly, the various shield spells that were introduced a month or so ago now have proper elemental resistance bonuses tied to each of them. There actually was a sort of elemental "combo system" that we'd implemented, too, but as the very savvy Jerebaldo1 pointed out from the release notes before the release even came out, it was possible to exploit. We have some other ideas about elemental combo systems, but coming up with something simple, fun, and non-exploitable is going to take some more thought and discussion. I overlooked one major class of exploit with my first pass at such a combo system, but that doesn't mean that a combo system of that general sort is impossible. There are also two new enemy types in this new release. The first is Red Slime, which is a stationary enemy that you'll only encounter (for now) in the intro mission. I imagine that the slimes will make some appearances elsewhere in the game in the future. The second new enemy is the Water Esper, which is now mixed in with Lightning Espers to show a bit of what can be done by mixing "identical" enemies that have differing elements but little else. Let's see, other stuff... There's an awesome new ocean music track in this release, and there's a goodly bit of new furniture/objects, particularly in the ice age areas. The intro mission has another two surface chunks and a new building with ten rooms in it. Coffers are now used in some stash rooms throughout the game now, rather than being exclusively limited to the intro mission. And there were a number of bugfixes. Keith is still completely immersed in the multiplayer aspects of the game, but that's getting to a point where I expect we'll be able to do some internal testing with staff within a week or so. There's still a lot more to do before a public release even after that, but it's a promising step. More to come tomorrow: my ardent hope is to wrap up the last segment of the intro mission (which takes place underground) tomorrow. Knock on wood, I think that all of the major game extensions that are needed for the intro mission have already been put in place, so I should be able to wrap things up. Then I'll be back to new content for the main game itself, which I'm really looking forward to. Enjoy! AVWW Beta 0.536, "Snake In The Window," Released! This one is another one that has been several days in the making because of the intense number of internal changes that have been a part of it. The recently-revised multiplayer model is continuing to get further along, and as a part of that we've done some refactors to help make for (longer-term) fewer bugs in both multiplayer and solo. The intro mission is also progressing nicely, and you'll notice some changes to the first three sections of the mission that were previously released (these changes will only be in new worlds, not existing ones, FYI). Actually a fourth screen has now been added, and the first four (of ten) rooms inside a new building type for the intro mission, but since there were six missing rooms that lead more or less into black holes, all those new screens are disabled in this build. More to the point for this release in terms of existing players, there's a number of bugfixes and tweaks. The light snakes are now a lot more exciting and useful as they move faster, go further, and reveal the minimap as they go. A lot of buildings now include some interior windows looking out at the sky when they are aboveground, making structures feel less enclosed unless you're actually underground. More to come in the next couple of days, including an easy new enemy type that will be used in the intro mission. Thanks for bearing with us during this period of work on the intro mission and multiplayer -- we'll be back to the features that are likely to be more exciting to our existing players soon. Enjoy!